It is already known that Mercedes-AMG G 63 and Nissan Kicks will be at the Autocar Performance Show 2018. 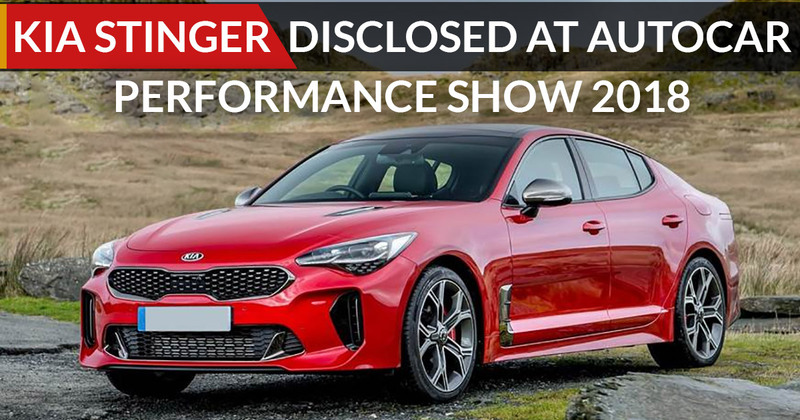 It has been confirmed that Kia Stinger will also be available at the show. When Kia unwrapped the Stinger at the 2017 Detroit Motor Show, it shocked the world. It is the first car of the company which has the true performance, a four-door sports sedan which was constructed under the care of ex-BMW M specialist Albert Biermann. Worldwide Kia offers 3 powertrains with the Stringer but the powertrain which will be offered at the Autocar Performance Show 2018 is the highlight of the range- the GT, with a 3.3-litre, twin turbocharged petrol powertrain that produces 365hp and 510Nm of torque. Acceleration of 0-96kph in 4.7 seconds and the top speed is 270kph. The Stinger is packed with the kit. In high-performance GT guise, the Stinger consists of 8.0-inch touchscreen infotainment system, a 360-degree view camera, a head-up display, a 15-speaker Harman Kardon audio system, dual-zone climate control, power-adjustable front seats with ventilation and Nappa leather upholstery, a powered tailgate and a full suite of safety systems along with Brembo brakes, electronically controlled suspension and a limited-slip differential to go with its sports sedan aspirations.